The definition of wire, as found at www.freedictionary.com is: “A usually pliable metallic strand or rod made in many lengths and diameters, sometimes clad and often electrically insulated, used chiefly for structural support or to conduct electricity”. There are other definitions and meanings of the word wire, but for all intents and purposes in the electrical world, this definition for wire will suffice. In this article we are discussing wire found within the home or residential electrical environment. Electrical wire size is measured using a standard known as the American Wire Gauge (AWG). Smaller wire has a larger number. For example, #22 AWG could be the size of the wire used in telephone or data communications cable. #14 or #12 AWG wire is used for general purpose branch circuits, #10 AWG wire for an electric clothes dryer, and #8 AWG wire for an electric range. The numbers continue to drop as wire sizes grow right down, (or up) to #0, or #1/0. Then the pattern of ‘smaller number is larger wire reverses, and you have #2/0, #3/0, and #4/0. After this, larger wire goes to another unit known as kcmil, or MCM. Wire used for branch circuits in a house is now always composed of copper, and is in the form of a solid single strand up to and including #10 AWG. #8 AWG wire and larger will be composed of multiple strands of smaller gauge wire (usually 7 strands) wound together to form one conductor or wire. Wire for the main service may be aluminum, typically in sizes of #2 AWG or larger. Wire is a conductor (allows the free flow of electrons) of electricity, but some metals make better conductors than others. Iron wire is a relatively poor conductor when compared to copper wire, and gold wire is a better conductor than copper wire. However, a good balance of strength, pliability, and conductivity is found in copper, and that is why it is the most common choice for electrical wire. A more detailed article about electrical wire can be found by clicking here. 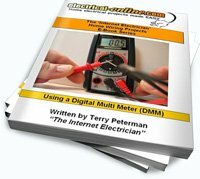 This entry was posted in Tools, Wiring Supplies and tagged American Wire Gauge, AWG, conduct, conductor, electrical wire, electrically insulated, electricity, house wire, metallic strand, residential wire, rod, wire. Bookmark the permalink.